Association exists to serve the owners. Board exists to speak for the owners. Board may hire agents to act on behalf of owners. Association does not exist to serve the Board or management. Owners pay even when the Board or SCA agents make mistakes. Agents, including SCA employees, have no rights superior to owners’ rights. Rules exist to protect owners. The Board needs to learn the rules and follow them. 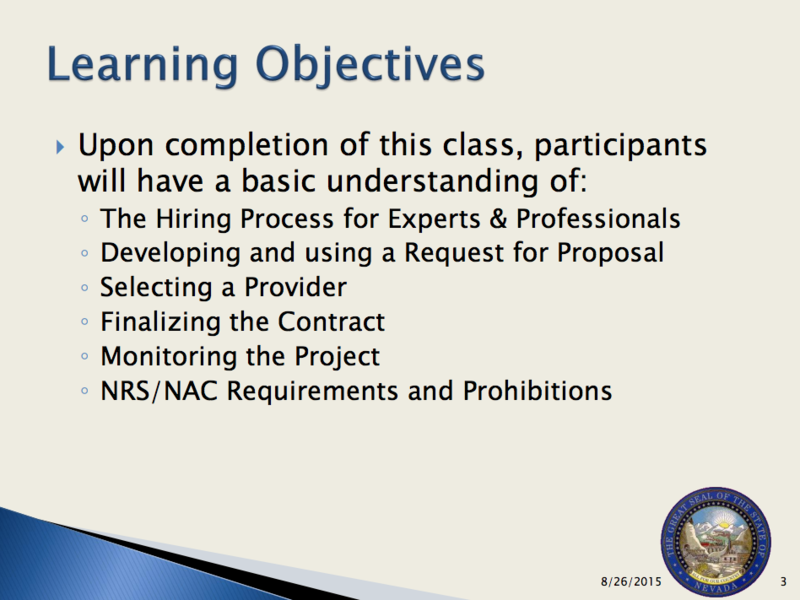 How can NRED training help the Board do right? Without proper training, the Board is ignorant. The Clarkson Law Group trained the Board to consult attorneys before ANY decision to the point of letting attorneys decide. Being ignorant, the Board has failed to protect owners from agents’ actions. Board needs to learn the rules set up to protect owners and follow them. 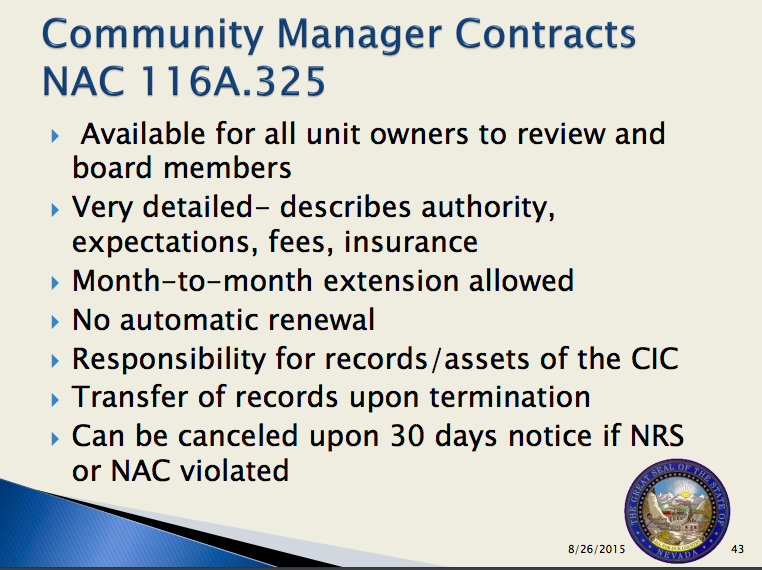 The GM did not sign a management agreement with terms required by NRS 116A.620. The Clarkson Law Group hired as SCA debt collector without an RFP for debt collector issued. without competing with NRS 649 licensed vendors. 1. When SCA became “self-managed”, the GM/CAM were hired without of a management agreement. Absent a management agreement, the GM is an “at-will” employee and has no other rights than those bestowed by the SCA Employee Handbook. 2. RFPs are required for professional services not just construction or maintenance contracts per NRS 116.31086.
which resulted in diminishing the integrity of the election process. Four of the six Board members who allowed the GM to usurp the Board’s authority benefitted personally from unlawfully hiring a CPA to replace the Election Committee. Owners’ right to lawfully petition for a removal election was besmirched by the subjects of the petitions who wrongfully blamed the owners who petitioned for their recall for the huge cost of hiring a CPA that was done solely, 100%, by the GM under their watchful, grateful eye. Hiring a CPA wasn’t the only way the GM sashayed in to usurp the authority of the Board, but to really take over, all dissent had to be crushed. These are things a properly trained Board would never have tolerated. As the liaison to the Election Committee, I tried to get the GM, President Rex, and the attorney to leave the Election Committee independent and neutral to do their normal job during the recall. I was removed as the Board liaison to the Election Committee by the very people accused of interfering with the Election Committee’s independence. The GM and the attorney decided to relieve the Election Committee from its duties despite having no legal authority to do so. I gave the Board notice of my intent to file a complaint of harassment and retaliation for all the actions they had taken against me in retribution for my recommending that the attorney and the GM be fired. The Board took the law into their own hands and kicked me off the Board without notice, process or appeal. Kinda the same way Putin handled the one serious challenger to his re-election. GM and one Director met with one competitor to give a leg up prior to RFP. Board was not informed of GM + director actions until it was a fait accompli. 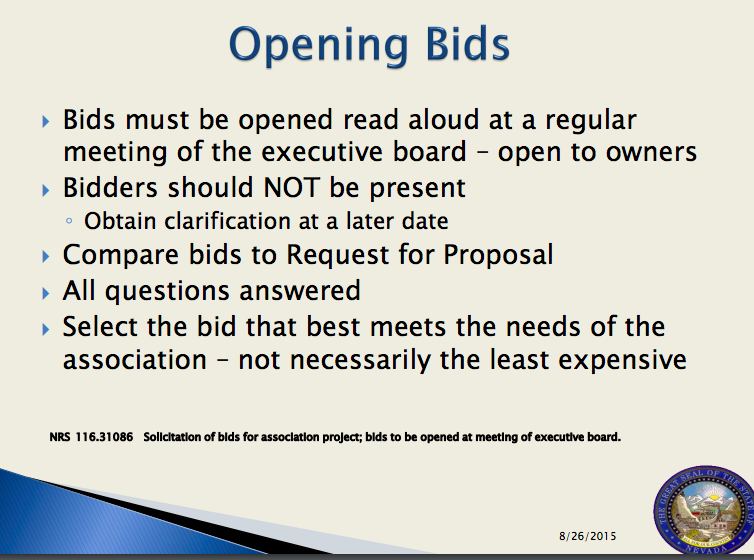 Bids were not opened at a Board meeting. Bids were not not submitted on the same terms. After the number of vendors dropped to two, the “operating parameters” were adopted. Winning bidder who negotiated with GM in advance was allowed to change bid after the other bidder dropped out because the terms had been changed. No other bids were sought nor considered. 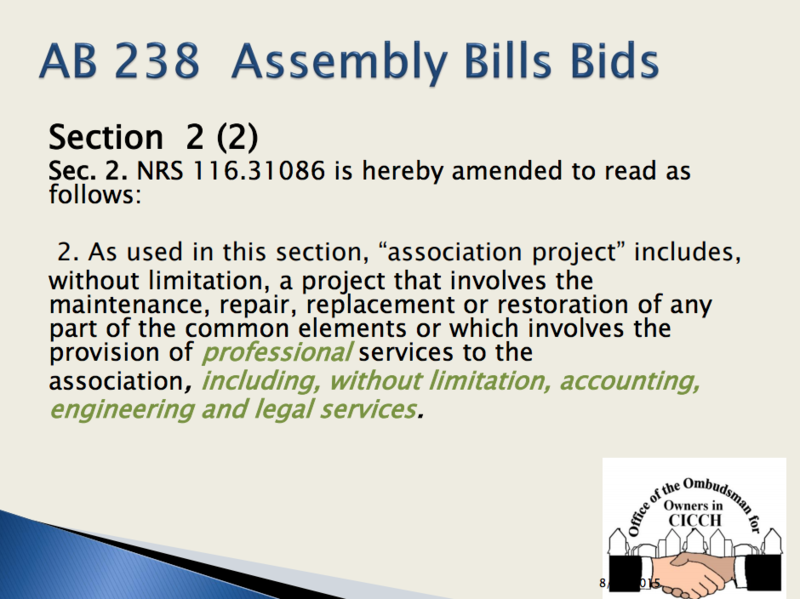 HOA Lawyers Group became SCA’s debt collector without issuing an RFP to replace the defunct Alessi & Koenig, LLC? The Clarkson Law Group became the SCA debt collector without a RFP? The Clarkson Law Group, hired via the RFP issued to replace the Leach law firm as SCA legal counsel, used its “authority” as the SCA legal counsel to “rule” that its own selection as the SCA debt collector did not require a separate RFP? Who cares about debt collection? We all should. Debt collectors are the source of huge expenses for HOA owners because of the weird way the Nevada courts allow HOA foreclosures to extinguish the bank’s security interest. While you might think this is good for HOAs, it is actually only good for the debt collector. The cost of collection exceeds the amount recovered. HOA homeowners pay for the debt collectors’ fight with the banks. The loss of property value to each and every home in a Nevada HOA is, according to the UNLV 2017 study commissioned by the Nevada Association of Realtors, is 1.7% per foreclosure for delinquent dues. I’m not 100 convinced about this post. Your opening points are spot on, but conversely it’s dangerous to base things upon what others may think. Please expand this, because I believe you’re a very eloquent writer and I hope to learn more from you!